1 Set a kettle barbecue to cook at medium-high heat. 2 To make the dry rub, combine paprika, mixed herbs, chilli powder, ground coriander, cayenne pepper, garlic powder &amp; brown sugar in a bowl. In a separate bowl, mix the white wine vinegar and salt until salt is dissolved. 3 Place the pork belly skin side down on a board and score the meat with diagonally crossing lines. Oil the meat and coat well with dry rub leaving the skin untouched. Turn the belly over and brush well with the salt &amp; vinegar mix. Leave to marinate for 1 hour. 4 Place a rack over a deep baking tray and place it on the BBQ grill. Pour the cider in the baking tray and place the belly on top. Cook for 1 hour 45 mins with the lid on, checking the the barbecue at 45 minutes and adding more charcoal if necessary. 5 To make the red cabbage slaw, finely slice the cabbage and spring onions and grate the carrot. Place all three in a bowl and add the lemon juice &amp; Hellmann’s Real Mayonnaise. Season with salt and pepper and mix well. 6 When pork is cooked remove from bbq and slice into thick pieces. Half the baguette and cover well in Hellman’s Honey BBQ Sauce. 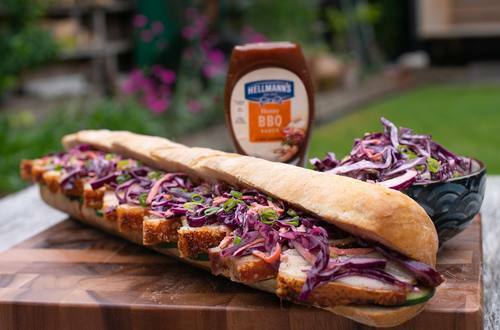 Fill baguette with sliced cucumber, pork belly slices and the red cabbage slaw. Slice the baguette into three and enjoy!